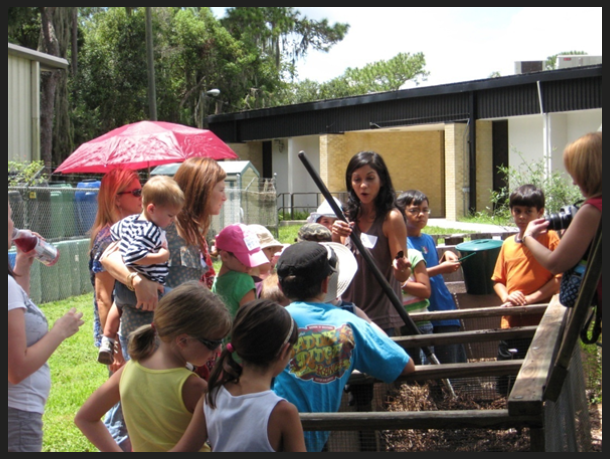 On a monthly basis, from February through November, we present Composting, Microirrigation and Rainwater Harvesting Workshops at the UF/IFAS Extension Hillsborough County. These workshops are free to Hillsborough County residents. The Composting workshop provides information about home composting, how to turn trash into treasure. Attendees will learn how to recycle kitchen and yard waste, while creating a rich soil amendment. Compost adds nutrients to the soil and retains moisture in the root zone where it can be used by plants. Composting workshop attendees receive a compost bin and thermometer. The Microirrigation workshop teaches attendees how to have a healthy and attractive lawn and landscape while conserving water. Tips on installing and using microirrigation are also presented. This irrigation method not only conserves water but is less restricted by current water restrictions. Microirrigation workshop attendees receive a microirrigation kit. In the Rainwater Harvesting workshop, you will learn how rain barrels, made from a 55-gallon plastic food-grade drum, are useful in collecting rainwater for landscape bed and ornamental plant irrigation. Harvesting rainwater reducing erosion, potable water use and stormwater runoff. Rainwater harvesting workshop attendees receive a rain barrel that has been drilled and spigot installed. These workshops follow the nine principles of the Florida-Friendly LandscapingTM program, which include: Right Plant-Right Place, Water Efficiently, Fertilize Appropriately, Mulch, Recycle, Manage Yard Pests Responsibly, Attract Wildlife, Reduce Stormwater Runoff and Protect the Waterfront. Each of our workshops is an hour, starting with Composting at 8:30 am, then Microirrigation at 9:30 am and Rainwater Harvesting at 10:30 am. We provide one informational packet/item per household/address. The representative of the household must be an adult. Those who have already attended a workshop before are not eligible to attend again. You can access our calendar of events at: http://hillsborough.ifas.ufl.edu/calendar.shtml. The registration process is easy, as is finding our office which is located at 5339 County Road 579, Seffner 33547, just south of I-4, Exit 10. You can walk through our teaching gardens, view our mulch and compost demonstration areas and receive brochures on water and environmental conservation and much more. We hope to see you soon.